In 2016, the Canadian Touring Car Championship reached a milestone as the series was celebrating its tenth anniversary. 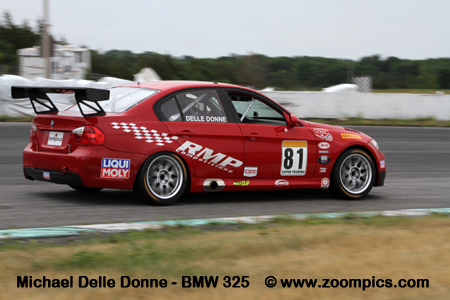 With sponsorship from Continental Tires, the championship consisted of seven race weekends at five different tracks in Ontario and Quebec – Canadian Tire Motorsport Park, Calabogie Motorsport Park, Circuit ICAR, Shannonville Motorsport Park and Trois-Rivieres. Touring: This is intended to be an entry-level category. Vehicles competing in this class are allowed minimal performance enhancements. Manufacturers represented in this group include the – Mini Cooper S, Honda Civic Si, Acura RSX and Hyundai Tiburon. Super Touring: Super Touring includes many of the same makes and models found in Touring. However, this category allows engine modifications and aerodynamic body enhancements. Additional manufacturers competing in this group include BMW and Porsche. 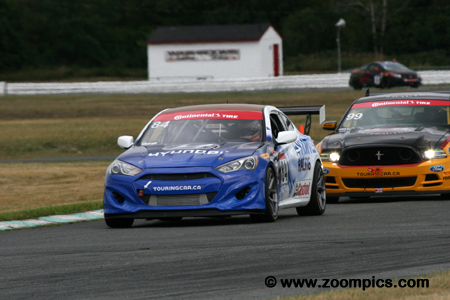 Grand Touring: The Hyundai Genesis Coupe and Ford Mustang are two of the most popular cars racing in this category. Of the three classes, these cars produce the most horsepower. The event held at Shannonville Motorsport Park was called the Summer Challenge. This track hosted rounds seven through nine which marked the halfway point of the season. Competitors would race on the 2.47-kilometer Pro-Track layout in 30-minute contests. Fifteen cars qualified for the weekend’s first race but only fourteen would take the green flag. On the pole is Super Touring competitor Eric Hochgeschurz in a BMW 330i and next to him is the Honda Civic Si of Karl Wittmer. 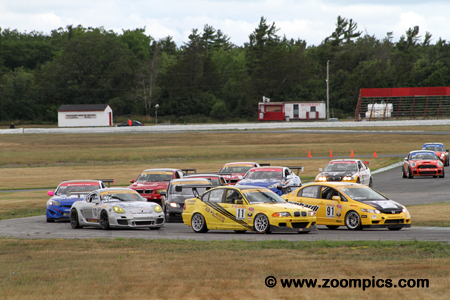 Behind the front row is Scott Nicol also racing a Honda Civic Si and Jerimy Daniel in a Porsche Cayman S. Competitors would only make it as far as turn two before the race experienced its first incident. 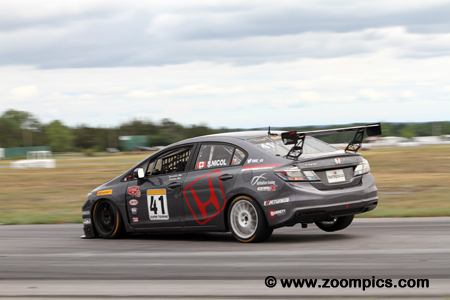 Super Touring competitor Scot Nicol driving a Honda Civic Si started fourth on the grid in the weekend’s first event. Nicol made good progress during the race and finished second – 7.248-seconds behind race winner Hochgeschurz. In round-eight, he took the victory after Hochgeschurz retired. Unfortunately, Nicol encountered electrical problems in Sunday’s final and finished twelfth overall which was good for a fifth in class. 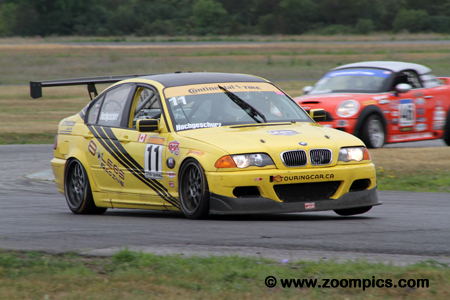 Starting from the pole in the weekend’s first race was Eric Hochgeschurz competing in the 8Legs Racing BMW 330i. Hochgeschurz led flag to flag to score his second win of the 2016 season. A broken throttle cable in round-eight robbed him of any chance for a victory. In Sunday’s final race he rebounded and scored his second Super Touring win of the event. He left Shannonville as the point’s leader. 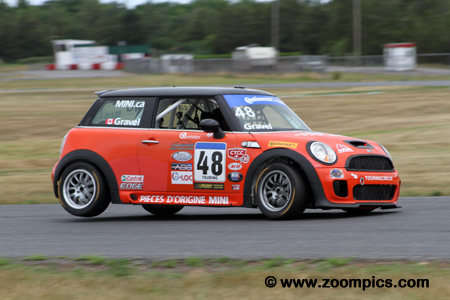 It was a perfect weekend for Michel Sallenbach in the Team Octane prepared Mini Coupe. The Roxton Pond, Quebec driver, started from the Touring class pole-position and led all three rounds flag to flag for the ‘Hat Trick’. The 2014 Touring Car champion now had a total of six class victories and like Hochgeschurz left Shannonville as the point’s leader. 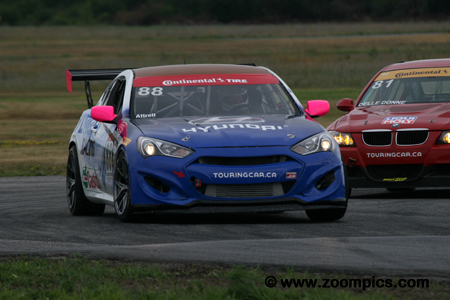 Blanchet Motorsports entered two Hyundai Genesis Coupes. The No. 88 was driven by new car dealer Bob Attrell. Attrell started the weekend off by qualifying fifth overall and first in the Grand Touring class. He led much of race one until passed by Chris Sahakian on the final lap. In Sunday’s races, Attrell would redeem himself by taking two Grand Touring class victories. 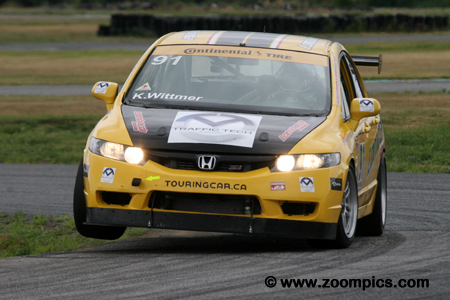 One of the very quick Wittmer brothers, Karl, qualified second overall and in Super Touring for Saturday’s race. Driving the Lombardi Honda Civic Si, he finished third in round-seven. In Sunday’s first race he scored another third overall and in Super Touring. Transmission problems in the weekend’s final event caused Wittmer to finish eleventh overall which was good enough for fourth in class. Team Octane entered three Minis in the Touring category. The No. 48 was driven by Quebec competitor Paul Gravel. The series veteran, Gravel, had scored his best result to date in round two at Canadian Tire Motorsport Park - this was a second place. His three podium finishes at the Summer Challenge event allowed Gravel to maintain third in the Driver’s Championship. Jerimy Daniel suffered damage in the first lap skirmish at corner-two on Saturday and as a result lost his headlight. Despite the incident, Daniel was fourth in the Super Touring category. His results improved in round eight when he finished second overall and in class – just 2.897-seconds behind overall winner Scott Nicol. And, in Sunday’s race, he posted the same results - second overall and in Super Touring group. Consistent finishes had allowed Chris Sahakian to lead the Grand Touring points standings. 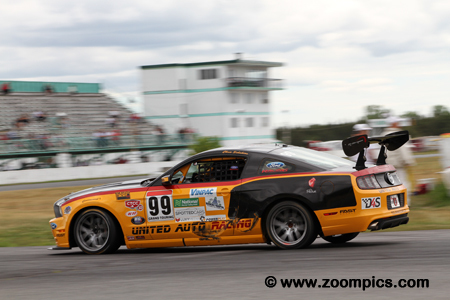 To date, the driver of United Auto Racing Ford Mustang had four podium finishes. But Shannonille would be a turning point for Sahakian as he scored his first class victory which was earned with some battle scars. In addition to his win in round seven, he had two seconds in Sunday’s races. 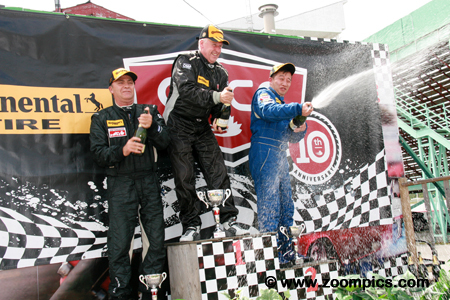 John Young scored a Touring class victory in round two at Canadian Tire Motorsport Park. The driver of the No. 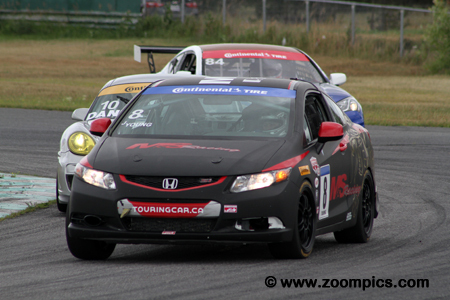 8 M&S Racing Honda Civic Si would rack-up three second place finishes at the Summer Challenge event. These results would allow him to maintain his second place in the Touring category Driver’s Championship. 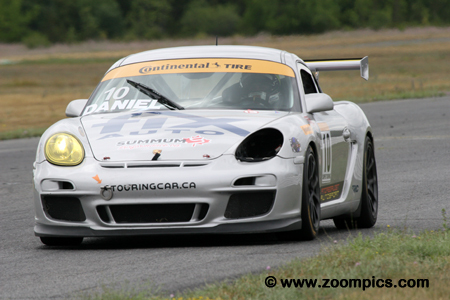 Driving the second Blanchet Motorsports entry was 2012 and 2013 Touring car champion Damon Sharpe. 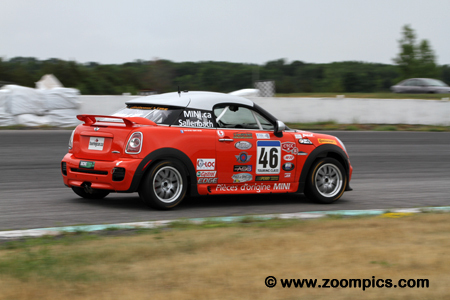 Sharpe qualified eighth overall and third in the Grand Touring category for Saturday’s race. He was consistent throughout the weekend earning the final spot on the podium three times. Sharpe left Shannonville trailing class leader Chris Sahakian by 114-points. The Touring category podium looked the same for all three races during the Summer Challenge weekend. In the center is the driver of the Team Octane Mini Coupe – Michel Sallenbach. To Sallenbach’s left is John Young with three second places and completing the podium is Paul Gravel.